President Trump’s bailout is a Band Aid for a farm economy that is hemorrhaging. We need to ask why U.S. farmers and rural communities are so vulnerable to tariffs from other countries. The answer is a broken farm policy, created by corporate agribusiness, that prioritizes overproduction over everything else — including our farmers, our communities and our environment. Here in Iowa, we see the results of this Farm Bill in the wave of new and expanding factory farms producing pork for export markets. Iowa communities are already dealing with 750 impaired waterways; the loss of independent family farm livestock producers, and the decline of our rural communities, all caused by over 10,000 factory farms in this state. Nearly all the benefits are extracted to the corporations who do the exporting. The expansion of new factory farms is fueled with government-backed loans to build new factory farms, economic development funding to help locate new slaughterhouses, and government subsidies for factory farms to handle the massive amounts of manure they create. Decades of corporate-controlled markets and farm policy that incentivize overproduction have put farmers in this vulnerable position — dependent on fickle export markets, that can vanish overnight. We need a functional marketplace where farmers are paid fairly, our rural communities supported and our environment protected. Congress is working on the Farm Bill right now. Instead of pointing fingers about the right short-term measure to help farmers survive Trump’s trade war, let’s fix our broken farm policy. A good first step would be to stop corporate factory farms from exploiting taxpayer-funded conservation programs, such as the Environmental Quality Incentives Program, and the taxpayer-funded guaranteed loan program to build even more factory farms. CFFE consists of Dakota Rural Action (SD), Food & Water Watch, Institute for Ag & Trade Policy, Iowa Citizens for Community Improvement (IA), Land Stewardship Project (MN) & Missouri Rural Crisis Center (MO). Iowa Falls, IA – This afternoon, nearly one hundred people gathered at Iowa Select’s office in Iowa Falls to demand CEO Jeff Hansen withdraw all pending factory farm applications and immediately stop building factory farms. With over 500 factory farms, Iowa Select is the largest pork producer in the state and has been expanding aggressively in the past year, despite mounting public calls for clean water and a moratorium. In 2017, the Hansen family donated $275,000 to the gubernatorial campaign for Governor Kim Reynolds. Community members delivered a letter to Hansen. “Building factory farms is not Iowa nice. Polluting our precious water with millions of gallons of untreated manure is not Iowa nice. Sickening our communities with hazardous air emissions is not Iowa nice,” the letter read. Iowa Select has been the subject of widespread scrutiny because of its massive factory farm expansion over the past year. Iowa CCI identified at least 27 factory farm applications associated with Iowa Select in the past six months, adding to more than 137,000 hogs. Iowa State University’s swine manure calculator estimates that this many finishing hogs would produce 57.5 million gallons of manure per year. These figures may be low, however, because Iowa Select uses various LLCs on their applications, making it difficult to identify all of their factory farms. In an interview with Successful Farming last year, Hansen acknowledged that the new slaughterhouses coming online – including the Prestage slaughterhouse south of Eagle Grove – are driving his expansion. The company also regularly builds factory farms just under the threshold that would trigger more state and local oversight. For instance, confinements with 2,500 head of hogs require the Master Matrix – but Iowa Select often avoids it by applying for confinements with 2,490 head of hogs. 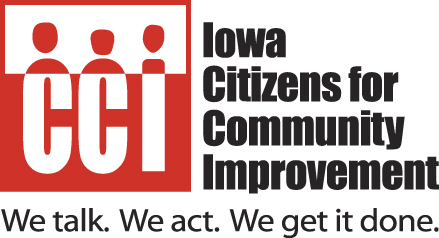 Iowa Citizens for Community Improvement is a statewide, grassroots people’s action group that uses community organizing to win public policy that puts communities before corporations and people before profits, politics and polluters. CCI has been fighting to put people first for over 40 years. Follow us on Twitter at @iowacci. Bruce Rastetter has applied to build a 4,999 head factory farm about 2 miles North of Williams. This factory farm alone will add 1,642,172 gallons of manure into our watershed. Hamilton County already has 212 medium or large factory farms. Agribusiness corporations like Summit Farms get the profits—we get the pollution. Factory farms lower our property values, kick independent family farmers out of business, pollute our water and air, and tear our communities apart. Our air, water, and communities are more important than Bruce Rastetter’s profits. Send an email to the Hamilton County Supervisors asking them to take points off the Master Matrix. Join us on Tuesday, March 6 @ 6:00 pm at the Williams Fire Station on Locust Street for a community planning meeting. When we stand together, organize, and fight back against greedy proposal like these, we win. Click the link below to read CCI’s full objections to the Rastetter – Williams 15 factory farm application.